It was no 28-3, but the New England Patriots found themselves trailing steadily in Super Bowl LII. At the end of the first quarter, it was 9-3. At halftime, it was 22-12. And by the end of the third quarter, the Patriots found themselves still trailing by a minor gap, 29-26. Despite the highest total yardage in any postseason game (and Tom Brady throwing for a record-setting 505 yards), the Philadelphia Eagles always seemed to have one extra play over the Pats. Brady can’t catch a pass on a trick play? Can-do backup Nick Foles can catch one for a touchdown. New England charges down the field for a score to almost catch up? The Eagles answer them. Philly even got two questionable touchdowns called in their favor, with the Twittersphere wondering what, exactly, constitutes a catch in the NFL. The defense seemed to have few answers for Foles, who threw for 373 yards, three touchdowns, and one interception, ultimately winning the Super Bowl M.V.P. award. The game had several surprising factors, from two missed extra points to the mysterious absence of Super Bowl XLIX hero Malcolm Butler, who didn’t play a defensive snap, and was spotted tearing up during the pre-game performances. It wasn’t until the fourth quarter that the Patriots pulled into the lead with Rob Gronkowski’s second touchdown, capped, of course, by a defiant Gronk spike. But the relief was short-lived. The Eagles followed up with a clock eating drive, taking up nearly all the time remaining before coming away with a touchdown. And then the unthinkable happened. The first sack of the game came when the Patriots began their drive, and the ball popped out of the most valuable hand in football. 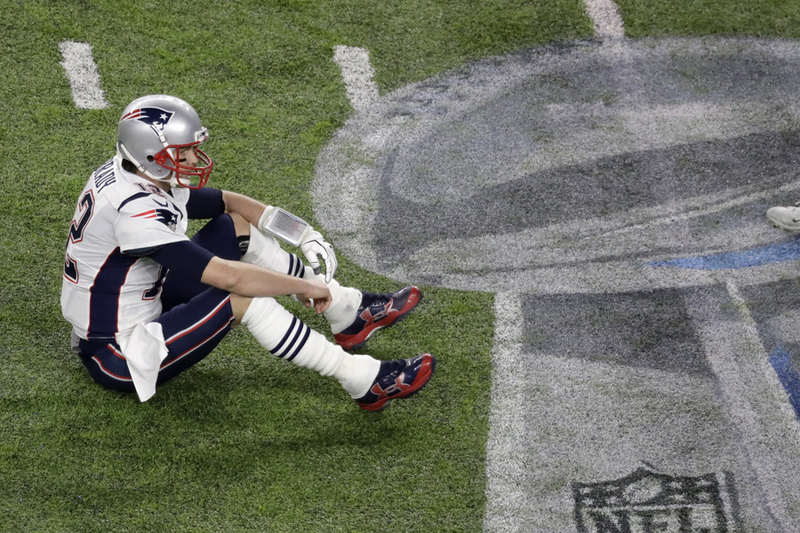 Tom Brady, king, GOAT, M.V.P., fumbled with the game on the line. The Eagles took back over, scored a long field goal, and with just under a minute left in the game, the Patriots couldn’t pull off another miracle. Final score: 41-33. An earlier version of this post said the score at the half was 13-9. It was 22-12.